One of the tallest plunge waterfalls in India. Nohkalikai Falls in Meghalaya State is the fifth highest and one of the tallest plunge waterfalls in India. 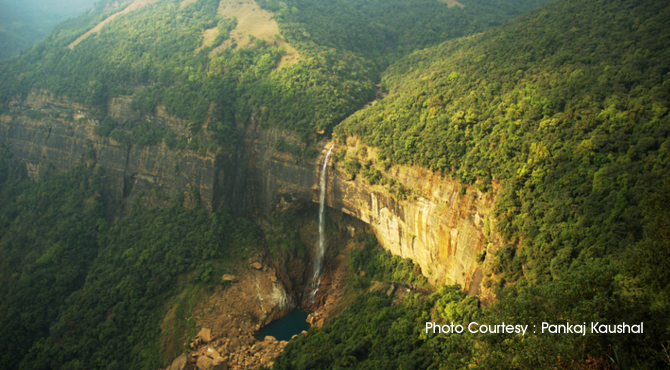 It is located in the East Khasi Hills District, about 7km away from Cherrapunji, the second wettest place on earth. For passionate nature lovers and wildlife enthusiasts, a visit to Nohkalikai falls is definitely worth a trip. Nohkalikai means ‘Jump of Ka Likai’ in Khasi language. The origin of the name was said to come from a tragic story. According to the legend a widowed woman named Ka Likai who had a baby girl from her earlier marriage. Ka Likia remarried, however, her new husband was envious of Ka Likai's love for her daughter. Out of jealousy, he decides to kill her. When Ka Likai was out gathering food and firewood, her husband killed the girl and uses her flesh to cook a meal. Ka Likai came home and asked about her daughter. He replies that he has not, but before Ka Likai goes out to search, her husband asks her to first have her lunch before going out. She ate the meal without suspicion but later she discovers her daughter's fingers in a basket. Mad with horror and grief, she jumped of the cliff adjacent to the falls. The fall has ever since been known as Nohlakikai or "the fall of Ka Likai." One of the most photogenic waterfalls in India, the water plunges from a height of 1100 feet (335 metres) uninterrupted from the highest point to the foot of the falls making it a spectacular site. The waterfall is a single drop falls and from the boundary of the cliff, it looks like a white thread in a sea of green woods. The falls are often covered with fog and mist which makes it difficult at times to view the falls properly. The force of water is profuse in summer while the flow recedes in the winter to a small stream. During June to November, which is during the monsoons and post monsoons, the falls have enough water and the water flows between the rocks and the cascading waterfall presents a breathtaking sight. A viewing gallery allows the visitor to enjoy the beauty of the place. There is another interesting option for enthusiastic tourists. Tourism Department has built steps which take tourist down to various other viewing points. The real beauty and can be experienced when one goes down at the base of the waterfall. However, it is a very tough trek from Nongriat dobule decker root bridge to the base of Nohkalikai, followed by the climb back up the stairs to the viewing gallery. The waterfall is a delight for adventure lovers. There are many things to do when visiting the falls like trekking, camping, bird watching, photography, swimming and angling. Timings : Open from 8 am to 6pm.The entry fee : Rs. 10. Meghalaya tourism provides a car park as well as some basic infrastructure to experience the falls. In addition to the walkways there are various food joints and restaurants around the area run by the local villagers. One can taste several types of food that ranges from the local Khasi delicacies to North and South Indian dishes, and Chinese noodles. There are also small souvenir shops nearby.